About Us | Breugel Bouviers Perm. Reg'd. First let me say, it’s not about us, it’s about our dogs! I have lived with and loved dogs all of my life. I’ve been fortunate to have shared my live with some wonderful wonderful dogs mostly herders and working dogs and yes, admittedly even two toy dogs. I do not believe in kenneling dogs. In my opinion, dogs raised in kennels do not get the stimulation and socialization they need to be a well balanced, happy dog. To that end, all my dogs are house dogs and yes, at times it does get a little crowded, but what great fun, having your own entourage follow you from room to room. I pride myself, as many other breeders do, in trying to produce a representative of the breed of the highest conformation, health and temperament. 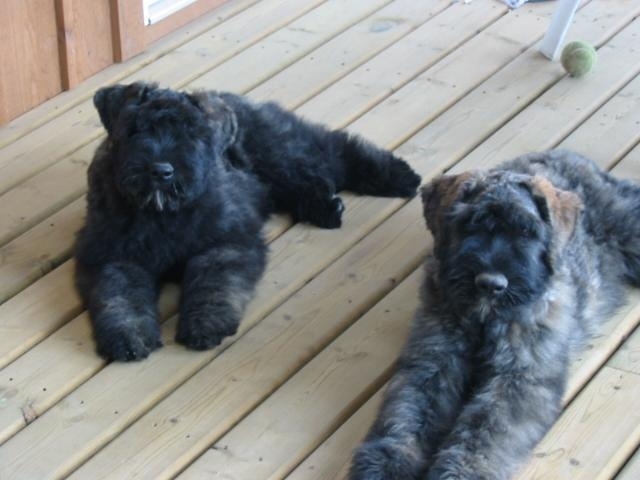 Our mission is simple – We strive to produce a limited quantity of quality Bouvier des Flandres to promote the breed taking into account temperament, genetic health and proper characteristics for the breed. We breed to the FCI Standard, steering clear away from supersized dogs with extreme angles. Proper size and movement is a must if these dogs are to stay true to their heritage. We participate in breed education, research and health test our dogs extensively prior to breeding them. Only dogs passing all five health tests (hips, elbows, heart, thyroid and eyes) are used in our breeding program. Over the years I have learned much about and from my furry loving friends and my hope is to share my admiration, devotion and knowledge about this wonderful breed with anyone that cares to listen.